A while back I wrote a post detailing which playing cards were best to use for magic tricks. However, I felt it could do with a little revising, and so I’ve created a new and updated guide for the best playing cards for magic tricks. Lots of people who watch magic tricks probably don’t pay a whole lot of attention to what cards are being used, but as a magician, there are so many different options that it can be intimidating to decide which deck you should start off with. A deck of cards is a funny thing, because on the one hand it is the most important piece of equipment a magician owns (90% of the tricks you learn will involve a deck of 52 cards), while on the other hand your choice of deck is not that important at all (most cards will work fine for magic, you don’t need to buy anything expensive!). 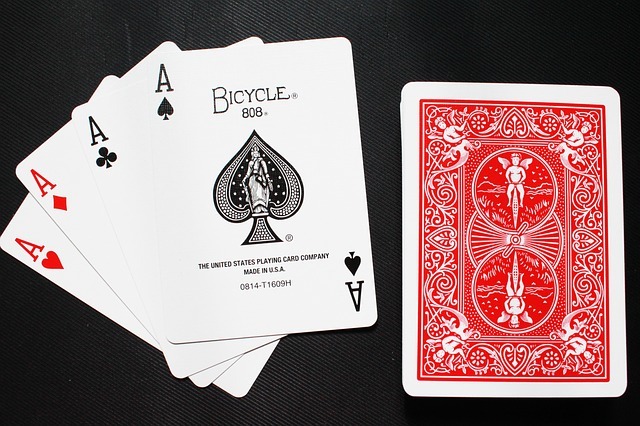 You can’t go wrong with some classic Bicycle playing cards. There’s a reason all the professionals use Bicycle cards: they’re the best. They’re also affordable, easy to find and order, and very recognizable. I could end this post right here actually, because that is more or less all you need to know when picking which playing cards to use for magic! The quality is guaranteed and the design is timeless. Most laymen will recognize the Bicycle style cards even if they don’t know much about magic, which instantly gives you more credibility in their eyes. Think about it. 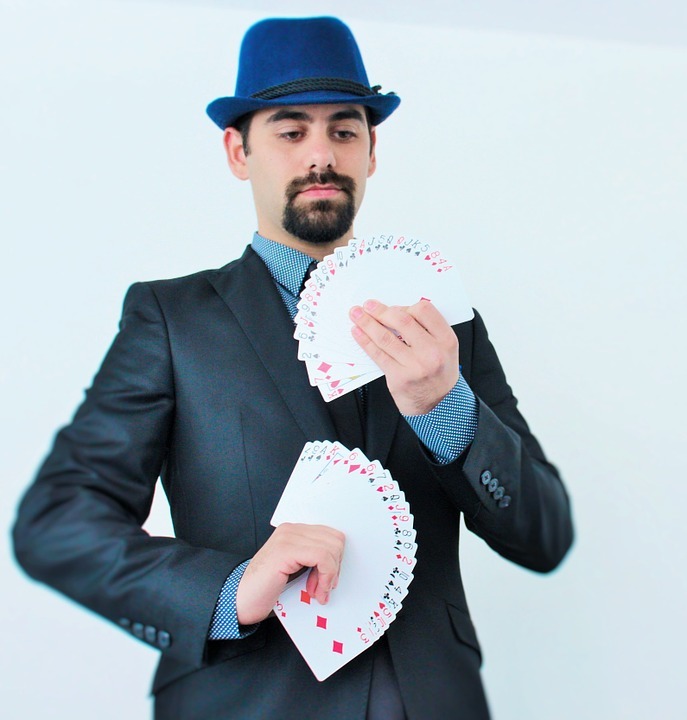 They’ve seen David Blaine, Penn and Teller and all the greats use the very same cards; that means you are at least as good as them in your choice of playing cards. This is a great way to make a good first impression with your audiences; even if it is only a small thing. What’s more, the Bicycle cards give great value for money. They can last for months on end and can be picked up from Amazon for around £5 for two packs (red and blue). If you use them for six months that works out to the same as around 40p a month per pack- and considering how much you will be using these cards, that is an exceptional deal. What about casino style playing cards? These cards are generally either used for gambling or gambling demonstrations. 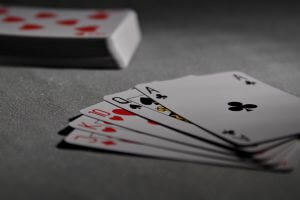 Gambling demonstrations involve a highly skilled sleight of hand artist ‘demonstrating’ how they cheat at cards; a great example of this is Richard Turner, who I will be writing an article on soon. Either way, you will be looking for a borderless style deck, and the best place to pick these kind of cards up is from the Bee card line. Made by the same company that produces bicycle cards, the quality of Bee cards is a guarantee, and they are also very affordable. Like Bicycle, they are also recognizable and add to your credibility as a magician. Now, onto a slightly different topic: Trick Decks. Firstly, it is important to mention that you don’t need trick decks to perform good tricks! Having said that, there are some definite benefits to having the odd trick deck or two in your repertoire, so here are 5 of the best trick decks to consider investing in. This was my very first trick deck, and so it holds a special place in my heart. I think this is a devious idea that can produce spectacular results if used right! Essentially, a stripper deck has a special function that allows you to locate any card at any moment, no matter how shuffled or randomized the deck is. It looks and feels completely ordinary. The great thing about stripper decks is that they can be used as a failsafe or plan B for your regular card tricks; imagine you are trying to control a card to the top as part of your Ambitious Card Routine, but you lose track of it. With the stripper deck you can instantly locate it and keep on going like nothing has happened. Well, there isn’t too much to say about this one. The deck is completely full of the same cards; for example, 52 King of Diamonds. This deck can be a great tool if used properly, but try not to make it look too suspicious, as the last thing you want is for people asking to see the deck. Take this one with a pinch of salt and just give it a go. It can work really nicely in the right situations. I’ve mentioned cardtoon a few times on this site already, but that’s for a reason. This trick is incredibly easy, and completely blows minds. Essentially, the spectator picks a card in their head, and a stickman drawn onto your deck of cards reads their mind. No seriously, you read that right. Read my review of cardtoon here to find out more! Again, I have already made an extensive review of this product so I will keep it short. This trick is a beautifully visual one that literally drops jaws. 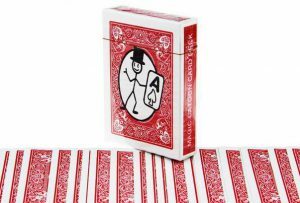 The main part of the trick involves you opening a drawn on door on the back of your boxed up deck of cards, and opening it right before their eyes, before closing it and wiping it off like it was never there in the first place. Read more about this trick here! I know what you’re thinking. Here he goes again! I know, I seem to mention the Invisible Deck on approximately 50% of my posts, but how could I not? This trick is just too good not to mention. With an ordinary looking deck of cards you can convince people that you have genuinely read their mind. This isn’t just a case of ‘oh wow, maybe you do have some kind of powers’, but more a case of ‘the ONLY WAY that you could have done what you just did was by reading my mind!’. Read more about this incredible effect here! And there we have it. A quick rundown of the best playing cards for magic tricks, and a brief foray into some of the better trick decks on the market! I hope some of this was helpful, and as always, if you have any feedback, comments or questions feel free to leave them below! What a great article and an excellent blog! My son has been very excited about the magic tricks but it is not as easy as it looks (I guess) – I personally haven’t tried any tricks but I think that the hands have to be really quick. Anyway – are there special cards for kids or should they practice with the same playing cards as adults do? I just think that their hands are smaller so it is harder for them to do the tricks, isn’t it? That really depends on the age of the child. You will definitely be able to find cards that are built for smaller hands but I would actually recommend starting out with the full size cards; if they are using the larger cards before anyone else they will have a huge advantage when they get older. Hope that makes sense, and thanks for the comment! 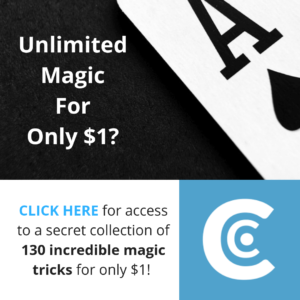 This is a really useful introduction to decks for magic tricks. 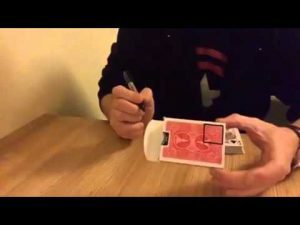 I recently got asked to do some card tricks (long story) and I had no clue where to start. Now I know where I should have looked! I personally prefer the quality of Tally-Ho decks, but they have the drawback of not being as universally recognized as Bicycle decks. I have had many a spectator come to the conclusion that I was using a trick deck (even though I wasn’t) when using Tally-Ho’s, but they rarely come to that conclusion when I use Bicycles. Yes, that’s a good point. People are automatically a little suspicious when you don’t bring out the Bicycle cards, which is ironic because many Bicycle decks are trick decks too! Thanks for all this great information, Benji. I am an older guy, just taking up magic in my retirement, and my fingers can get a little stiff and painful on some days. Is there a deck that is more flexible than others? I feel I would have an easier time with a deck like that. Thanks. That’s a really great question. In my opinion, the best way around this problem is simply to use 1 deck and really use it heavily; it will get softer and more flexible over time. There aren’t many decks that will come out of the box all soft and flexible; they’ll tend to be hard at first. But over time if you stick with the same deck (I would recommend Bicycles) they will naturally get more worn and softer as you continue. So the more you practice the easier it should get! Does that make sense?